A diaper cake for boys is a unique way to give an expecting mom a practical baby gift. When making a diaper cake for boys, you will typically find lots of blues, as blue is the general color that you find for boys. You can also have different types of themes for the diaper cake. Most parents will decide on a theme for the child’s nursery, and the baby shower will be centered on that theme. When looking at a diaper cake from afar, you may think it looks like a multi-tiered wedding cake. Most diaper cakes are used with only white diapers, causing it to look like a white cake. After further inspection, you will find that the cake is made entirely of diapers. The cake is actually made of around 50 diapers or so. Some larger tier cakes (4 or 5 tiers) use more diapers to construct the additional layers. The diapers are folded around a center post in a circular pattern to make each layer. Each layer is then stacked to make it look like a cake. You can make it as simple as you want, or as elaborate as can be. For a different look, some designers roll up each diaper and then arrange bundles of the rolled diapers to create each layer. For either design style, ribbons , baby care necessities, a plush or stuffed animal can all be attached to the diaper cake to complete the design. Naturally, these baby items are all selected to match the boy theme. You can find many different items on the diaper cake. 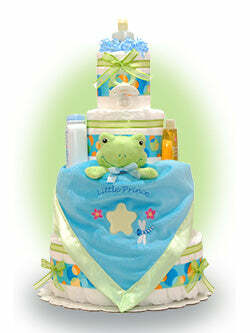 It’s common to find newborn baby shampoo, diaper powder, or baby lotion as gifts included with the cake. Some diaper cakes contain different colored baby bottles wrapped around the edges of the cake so that it will add more color to the aesthetic appearance of the entire gift. Cotton swabs, washcloths and body wash are a few other things commonly found on the the cake. Sometimes a receiving blanket is included on the base layer of the diaper cake to add more color. Diaper cakes for boys are made entirely from diapers that can all be used for the new baby. Proper construction of the diaper cake allows the new mom to disassemble the cake diaper by diaper. Sometimes, the cakes are made with differently sized diapers that will fit the baby as it grows. The cake can have many layers, but most of them typically have three separate layers. Typically, the largest cake that someone would choose to have made is composed of five layers. Six layers are also possible, but shipping considerations may limit this as an option for sending to the new mom. With the larger cakes, you could place a teddy bear for the new mother and her baby. Expecting mothers really love receiving these cakes as gifts – there’s nothing like watching a new mom use the items on the diaper cake as they are truly items required for the care of a newborn. Because the diaper cakes are such a unique baby gift, they can be sent in many different situations. For example, they can be used as a centerpiece at the baby shower or as focal point on the gift table. Any mother would love to walk into her baby shower and see the diaper cake used not only for a gift but as a part of the decorations. Diaper cakes don’t just have to be for the new moms to be either. Any workplace or group of friends can get one for a new dad as well. Few things are as satisfying as receiving a useful and thoughtful for a new baby that is on the way. If you’re planning to give a diaper cake as a baby gift, you should first think about what kinds of themes and contents would be the best fit for the mother and baby. Find out what the new mother and father are looking to put into the nursery. Take the time to find little objects that will match with their décor. 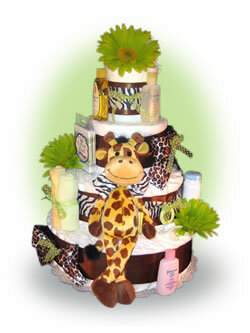 If the mother is going with a jungle type theme, you can adorn the diaper cake with stuffed giraffes or elephants from a local nursery store or from Lil’ Baby Cakes. The same is true for themes such as trains or cars that certainly match the diaper cake for boys theme. The average baby uses about seven to eight new diapers a day! Keep that in mind when choosing the type and size of diaper cake to get. It can take some of that new stress off the mother if she already has a supply of diapers on hand. Although these cakes are usually given to new or expecting mothers, those are not necessarily the only situations in which they’re appropriate. If you ask an experienced mother, she will always tell you, you can’t have enough diapers! If you want to do something nice for a mother who has already had her child, she would still appreciate the gesture and the diaper supply. That’s why a diaper cake for boys is an extremely practical gift. What parent wouldn’t be thankful for such a thoughtful gesture? Many people don’t give diapers despite their practicality because it’s a somewhat awkward or non-standard gift. The diaper cake brings elegance to the practicality and excitement to the whole experience of a baby shower or newborn’s birthday. Next time you are invited to a baby shower, consider alternatives before you go out and buy a new baby gift for the new parent. Talk to some of the people going to the shower and see what they are getting for the new mother to be. Most people attending baby showers love to get a single large gift from several people at a time so that they can get something greatly needed for the mother. Check out some of the diaper cakes that are available and you’re sure to find one that will go with the mother’s, or the new baby’s, theme. It can be a great way to help start up a brand new nursery, and the mother will be grateful. If you are hosting the party and you don’t know what to do for the mom to be, order or a diaper cake for boys – they always look great and the new parents will get use out of the diapers and the baby will grow up with a plush toy that could become their favorite.